In twenty years of development, the strategy of Vinaconex is to build a strong financial regime and incessantly expand financial investment. This orientation has helped Vinaconex reach the growth rate of 25 – 30 per cent, increase total asset thirteen times and turn over more than six times. In recent five years, the owner asset has increased nine times and benefits increased ten times. Considering financial investment as an important orientation of operation, Vinaconex actively participates in the currency market. Vinaconex is the founding shareholder of a number of companies such as Bao Minh Insurance JSC., Post and Telecommunication Insurance JSC. (PTI) etc, and jointly participates with other enterprises and leading corporations such as Bank for Investment and Development of Vietnam (BIDV), Vietnam partner, etc to establish Vietnam Investment Fund (VIF) – the biggest investment fund in Vietnam. Vinaconex is also actively working with Hanoi Housing Development Commercial Joint Stock Bank (Habubank), BIDV Securities Company (BIDVS), Saigon Securities Incorporation (SSI) and other credit agencies and funds to establish Finance Investment JSC. The main objective of Finance Investment JSC is to attract and effectively utilize financial resources for the development of Vinaconex, thus to make it becomes professional in financial market and effectively contribute to the benefit of shareholders. Furthermore, Vinaconex has a comprehensive relationship with a system of national and international banks. Vinaconex is the strategic customer of such renowned banks as Bank for Investment and Development of Vietnam (BIDV), Vietnam Bank for Agriculture and Rural Development (AgriBank), Vietnam Bank for Industry and Trade (VietinBank), VID Public Bank, Technical and Commercial Bank (Techcombank), Hanoi Housing Development Commercial Joint Stock Bank (Habubank), Joint Venture Bank between Industrial and Commercial Bank of Vietnam (Indovinabank), etc. Vinaconex also co-operates with international banks since their first participation in Vietnam market such as Saigon Bank, BNP PARIBAS, HSBC, Natexis Banques Populairer, ANZ Bank, Citibank, etc. 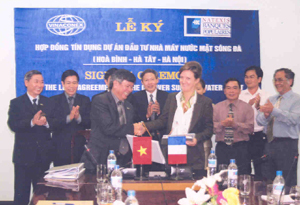 As a recognized brand name and incessantly development, Vinaconex created trust in the credit relationship with many banks, partners, and thus successfully mobilized and arranged sources of fund for investment projects such as Trung Hoa Nhan Chinh New Urban Area (Hanoi), Advanced Compound Stone (Ha Tay), Campha Cement Factory (Quang Ninh), Lang - Hoa Lac Highway, North An Khanh New Urban Area (Ha Tay), Song Da – Hanoi Water Factory (Hoa Binh and Hanoi), Thao Dien Urban Area (Ho Chi Minh). The funding channels are implemented in the forms of accumulating internal revenue, increasing charter capital and issuing shares, enterprise bonds and construction bonds to attract fund from outside shareholders. In addition, Vinaconex is approaching domestic and international capital and money market by listing the company and its subsidiaries on stock market. In the plan submitted to the government, Vinaconex will issue shares through stock market of more than 1,000 billion VND to supplement its charter capital in two years term, from 2006 – 2007. Especially Vinaconex is working with the Ministry of Finance and BIDV to prepare the issuance of international bonds in order to create an potential capital channel in the process of integrating into the region and the world of Vietnam in general and Vinaconex in particular. Vinaconex implements its activities through investing finance in subsidiaries and establishing a financial joint stock company.